(Bloomberg) -- South Korea and Japan are both facing a cyclical slowdown, led by softer global growth and downturns in key export industries, according to Bloomberg Economics. The South Korean economy’s greater openness means it incurs a harder initial hit from external shocks. 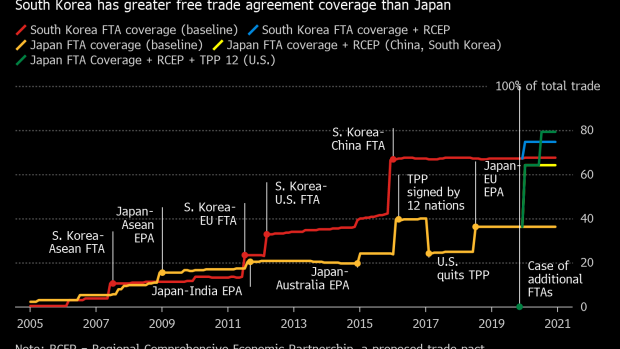 But its wider range of free trade agreements -- FTAs now account for about 67 percent of total trade, much higher than Japan’s 36 percent -- and its currency’s tendency toward weakness during risk-off episodes can help to jump-start export-driven recoveries.